Excellent condition. Great quality and fitted style, falls just to the top of the hip (short). Sleeves are long with button at wrist, can be rolled as shown too. Gentle machine wash.
Escada long wool coat. Very good pre-owned condition. The lining is like new. ESCADA Sport Wool Cardigan. Button front. Hoodie with strip. Wash and Iron inside out. 80% Cotton/20% Polyester. It's in excellent condition. This is an escalating jacket in a bright red color. Has a few tiny moth holes not actually through the fabric but where it's not as fuzzy. Less then a cm. Ingredients: 96% young wool, 4% nylon. Length: 57 cm. Half of the chest: 42-43 cm. Round neckline. PRODUCT INFORMATION Produced in Italy. Length about 110 cm. Sleeve length of about 65 cm. Shoulder width about 42 cm. Width of about 46 cm. 36 (38 to 40). Asia, Middle East. ESCADA 'SPORT'. Snap Closure at Neck. The Escada collection belongs to my wife and she bought them new. She is now retired and no need for these fancy clothes. Size 38 or AU 10. Five Escada signature plastic buttons on the front and matching buttons on the sleeves.
? Each piece carefully packaged in a protective, sealed bag ? Same day shipping on orders paid before 10AM CST ? 100% positive eBay feedback rating. Escada Women sport jacket, size 36. Escada Women sport jacket, size 36. Material is cotton with silk finishing inside. Beautiful pink color. The condition is great, like new. It was used a couple times. Sleeve Length (in) - 23. Armpit to armpit (in) - 21. Escada buttoned blazer featuring front pockets, peak lapels, and buttoned sleeve plackets. Fabric Content: Wool, Silk, Lycra/Spandex. Color : Brown. Size: 40 (GER). 40 40 50 XL S 31 31 42 79 79. Sleeve Length: 25". 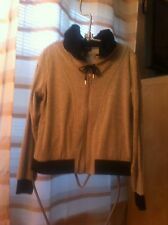 Escada Sport Black Wool Zipper Jacket Blazer Size Medium. Condition is Pre-owned. Shipped with USPS Priority Mail. Pre-owned, in great condition. Two front pockets. Side slits at hem. Slits at cuffs. Made in Italy. 60% new Wool, 30% angora, 10% cashgora. The zipper pull tab has peeled a little at the edge (pictured). Size 38 is equivalent to a medium. Measurements: 21” armpit to armpit, 28” length. SLEEVES COLLAR TO CUFF 29". LENGHT 34". A super chic pink tweed jacket from designer label Escada Sport! A beautiful cotton blend pink & white tweed, with zip front and cool white edging detail. Gather detail at sleeve edges & fully lined! Total Length: 32.5 in. Cross Chest: 24.25 in. This is purple velvet short fitted jacket with high collar and two pockets. With respect, Max. 100% Cotton. FABRIC STRUCTURE. AUTHENTIC ESCADA SPORT BELTED COAT. FRONT HIDDEN BUTTON CLOSURE, BELTED, BACK SLIT, LINED. LENGTH - 40". SIZE - EUR-38/US-M. LINING - 100% - VISCOSE. DESIGNED IN GERMANY. 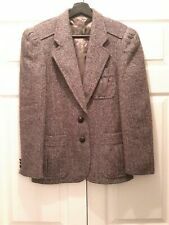 100% AUTHENTIC ESCADA TWEED NAVY BLUE CHAIN DETAIL BLAZER JACKET. EXCELLENT CONDITION. VERY RARE FIND. This ESCADA white jacket will go with dressy, casual, fancy. everything every way with your fashion sense. ESCADA Modern white Jacket. Unique Design &Very Modern Style. Very MODERN look cutting design. Escada double-breasted coat featuring a buttoned front, pockets, and buttoned sleeve tabs. Fabric Content: Wool. Want more?. Size: 40 (GER). Condition: This item is in very good condition. Displays minor signs of wear that may include slight snags, fuzziness, and/or interior blemishes. Has scuba feel to a material, but less structured and softer. Color: fantasy. Never transfer it to the third-party. Condition :B. About privacy. Beautiful Escada Women’s Jacket/ Blazer with Buttons Preowned in Good Condition Color: Salmon pink 100% Cotton Made in Slovenia Size: EUR 38 Great for Spring! Smoke Free, Pet Free Home Please email me for measurements before buying. Free Shipping! ESCADA Golden Brown Luxury PIACENZA Cashmere Silk Blazer Jacket - 10 Med. This chic classic blazer jacket has a five logo buttons down the front. Two front pouch style pockets. Long sleeves with 5 decorative logo buttons on each cuff. Lightly padded shoulder area. Fully lined with navy blue logo print rayon.